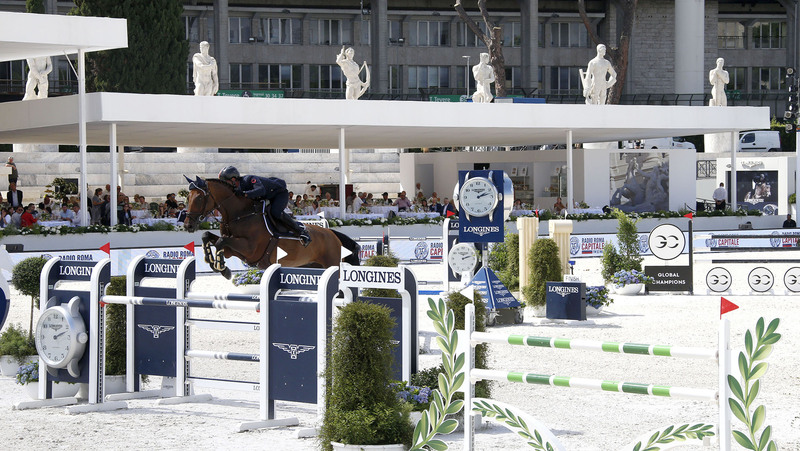 Luca Marziani (ITA) and Don’t Worry B with Emanuele Gaudiano (ITA) and Quinn van de Heffinck embellished home crowd expectations by charging into first and second place in the first competition of the Longines Global Champions Tour of Rome. Hot on their heels was Bertram Allen (IRL) and Hector van d’Abdijhoeve finishing just 0.01 seconds behind Emanuele. The first competition of the weekend was a 1.45m two phase class, with Italian maestro Uliano Vezzani producing a comprehensive first test for the international field of 58 starters. Framed by historic Stadio del Marmi the 15 obstacle challenge proved capable for the first three competitors, Alexandra Thornton (GBR) with Charielle, Scott Brash (GBR) with Hello Jefferson and Cindy van der Straten (BEL) with Calvia, all producing clear rounds along with another 21 riders including Edwina Top-Alexander (AUS) with Vinchester, Olivier Philippaerts (BEL) with Cigaret JVH Z, Simon Delestre (FRA) with Chesall Zimequest, Daniel Deusser (GER) with Calisto Blue and Harrie Smolders (NED) with Emerald to name just a few. Eric van der Vletuen (NED) and Zigali P S looked to challenge Luca Marziani’s lead as they entered the second phase at a lightening pace. Unfortunately, a rail at the third fence would place the combination 30th overall. Johan-Sebastian Gulliksen (NOR) and Via v. Karmenhoek Z would come close to Italians by setting a stellar time of 25.75 seconds, finishing fifth overall and only to be beaten by the experience of Ben Maher (GBR) and Winning Good sneaking into forth place with a time of 25.40 seconds. But the crowd would be bolstered after speed merchant Emanuele Gaudiano pulled out a typically fast round, powering to the top of the leaderboard, local spectators lifted as the Italian rider took over the top spot. But it would be an edge of the seat finish after compatriot Luca Marziani (ITA) pipped Gaudiano to the post, securing an Italian 1-2 in the first competition of the weekend. The GCL Rome kicks off at 15:45 local time, tune in live via GC TV and on FB Live!